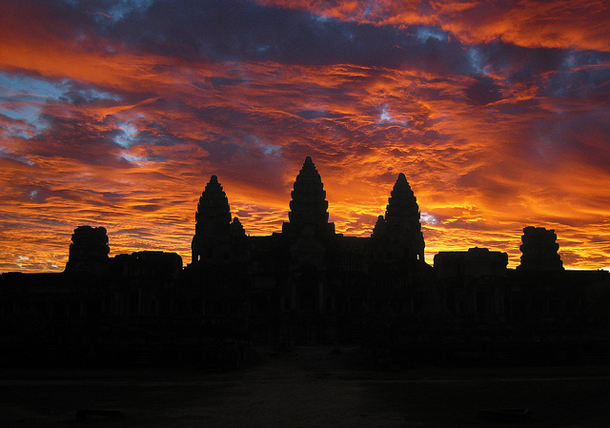 No country is as completely and singularly defined by a structure as Cambodia is by the Angkor Wat Temples. The image of the grand temples is ubiquitous: On the national flag, beer bottles, guesthouses and shops. They are so popular that many travellers choose to give the rest of the country a miss. If you want to admire the magnificence and the ambition of the Khmer Empire – the great creators of this edifice – then that&apos;s great. But you will only see half the picture. There is another side to Cambodia&apos;s history. And though this side is dark and disturbing, it still deserves to be seen. There is an important lesson in it for everyone to witness and remember. I came to Phnom Penh when it was slow and quiet. The streets were deserted, offices were shut and the royal palace was closed for visitors.An important religious festival, Pchum Ben, was going on. It is believed that the gates of hell are open during this time every year. Cambodians pay respect to their dead relatives in hope that it reduces their suffering in the afterlife. PP, as it is fondly called, represents the best of Cambodia. It lies on the banks of the Mekong River and boasts of a royal palace, plenty of museums and open spaces. The riverside is ideal for an evening stroll. The locals sit on the pavement, enjoy the view and the cool breeze. Beer and chicken, seafood and rice; the combinations are endless and readily available. The Royal Palace across the road and the National Museum close by, is definitely worth a visit. They are named as such simply because these were the places where mass murder took place. Clinically, cruelly, and without any remorse. The descendants of the Khmer Empire, the Khmer Rouge, committed horrendous acts. Pol Pot&apos;s regime slaughtered one million people, one in every four Cambodian, between 1975-1979 at various sites around the country. The fields are a chilling reminder of Cambodia&apos;s dark and bloody past. Choeung Ek, the killing field near Phnom Penh, preserves hundreds of skulls with descriptions of how the victims were murdered. It&apos;s the most heart-breaking story of the depravity of human beings. You may end up losing faith in humanity. It&apos;s said that they played loud music during the time of the execution so the victims&apos; screams could not be heard by the unsuspecting people. People were bludgeoned to death because bullets were expensive. In the name of idealism, men commit the most horrendous crimes. Compassion must be the basis of any ideology. After a sombre afternoon, I joined an entrepreneur friend, Jonathan, for dinner. Jonathan has done social welfare in various parts of the world, including Rwanda. He is now settled in PP with his wife and two adorable kids. "How has living in such disturbed places changed you," I asked. "The idea of right and wrong vanishes. It is replaced by quiet acceptance," he said. I think it is a valuable lesson. I took a bumpy six hour bus ride to Siem Reap. Plenty of buses operate between these two cities, but make sure you take an air-conditioned vehicle. Giant Ibis is the mostly reliable service of the lot. I took a common shuttle in the quest to save a few dollars. The sooner I forget the journey the better. My entry to Siem Reap started on the most odd note. "Do you want a lady?" said one local sitting on a tuk tuk and he wasn&apos;t deterred by my silence. "You want weed?" What kind of a man doesn&apos;t indulge in either of these said his judging expression. I quickly crossed the bridge and found myself on Pub Street. All of Siem Reap, locals and foreigners, gather on this bright and noisy street with one objective: To have a good time. The music isn&apos;t restricted to pubs indoor. It finds its way on to the streets. One song mixes with another to create a unique medley of noise. People dance, eat, drink and make merry. This is where the action is. Are they as good and grand as made out to be? The answer is yes. And they are far more crowded than you would imagine. The locals at the ticket counter were engrossed in the latest episode of Balika Vadhu. I told them the TV series originated from my country. They smiled in admiration, but didn&apos;t think the connection was worthy enough to offer me a discount. You can buy a day-long pass for 20$ and see the four most popular temples: Angkor Wat, The Bayon, Ta Prohm and Preah Khan. But if you want to get under the skin of this structure then go for the three-day pass. It deserves no less. The entire complex is a few kilometres wide, lined with tall trees. The lake, the trees and the breeze add to the allure of this Unesco World Heritage Site. I hopped on to a bicycle and started to explore the vast area. The heat can get demanding at times. It makes sense to always carry a bottle of water. The temples are a confluence of Hinduism and Buddhism. There are entire stretches of walls, from one side to the other, covered with the final battle scenes of the Ramayana. Good stories have no limitations, geographic or otherwise. The temples are at their best during sunset and sunrise but they are also most crowded at these hours. There are many photographers who will take the same shot as you, but the moment will be yours and yours alone. I hiked atop the small hill to witness the sunset. The setting sun from atop the temple was beautiful. There are vast grasslands in front, lakes beyond them and limitless sky with clouds playing hide and seek with the sun. A girl sang Cantonese songs and added some soul to the ambience. I spent the next three days roaming from one temple to another and then taking in the sights and sounds at Pub Street. In between, I discovered some delicious local desserts, a promising circus performed by underprivileged kids and even swallowed a cricket. There were plenty of magical moments in Cambodia. Chronicles of a desi nomad: Cambodia, I saw, I loved.